Slothy Vlogs and Theme Park Worldwide are the two finalists of Ride Rater’s inaugural Vlogger of the Year award. 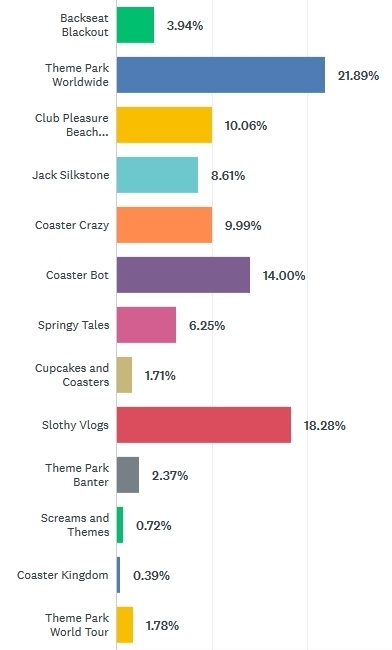 With 21.9%, Theme Park Worldwide topped the first round, with Slothy Vlogs closely following on 18.3%. As the award requires an overall majority vote, these top two nominees will now face each other in the runoff vote, which closes at 9pm on Sunday, 18 November. You can review each nominee’s YouTube channels via the links below, and vote for which one you prefer in the polling box beneath. Who should be Ride Rater Vlogger of the Year 2018? The two-round voting system being used in the award requires the winner to achieve an overall majority of votes from our website visitors – i.e. over 50% of the vote.